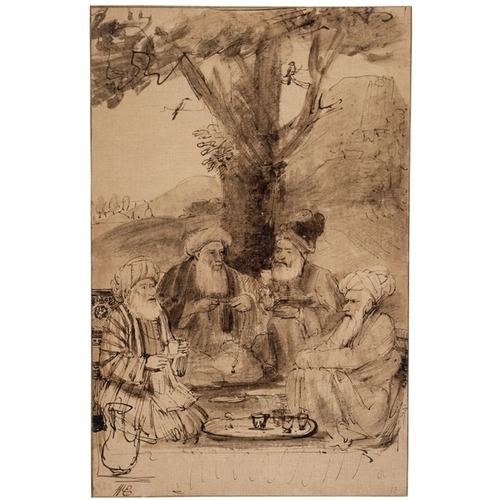 Among the most surprising aspects of Rembrandt’s prodigious output are twenty-three surviving drawings closely based on portraits made by artists working in Mughal India. These drawings mark a striking diversion for this quintessentially Dutch “Golden Age” artist, the only time he made a careful and extensive study of art from a dramatically different culture. 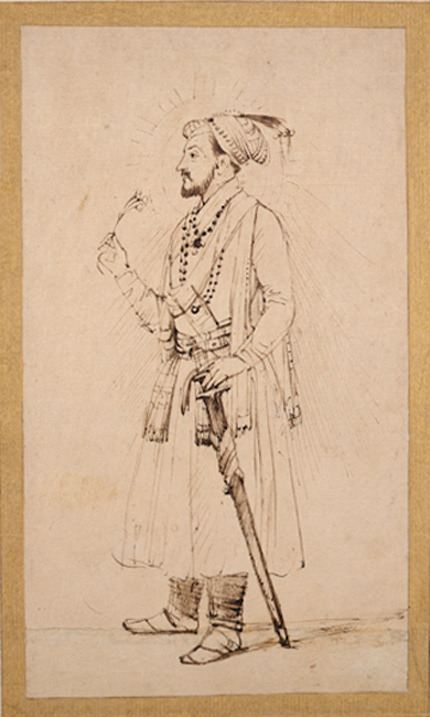 Rembrandt and the Inspiration of India explores for the first time the artist’s Mughal drawings, exhibiting them alongside the Mughal miniature paintings that inspired them to assess the impact of Indian art and culture on Rembrandt’s artistic interests and working process as a draftsman. 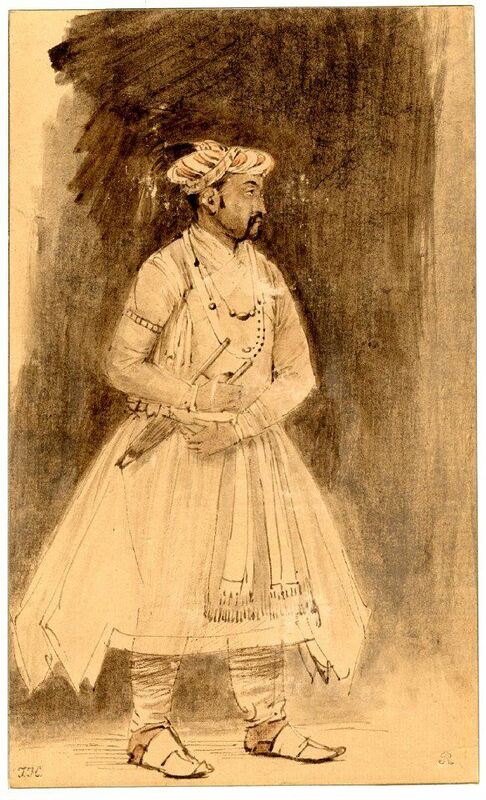 The exhibition pairs twenty of Rembrandt’s surviving drawings depicting Mughal emperors, princes, and courtiers with Indian paintings and drawings of similar compositions, which had been brought to Amsterdam from the Dutch trading post in Surat. 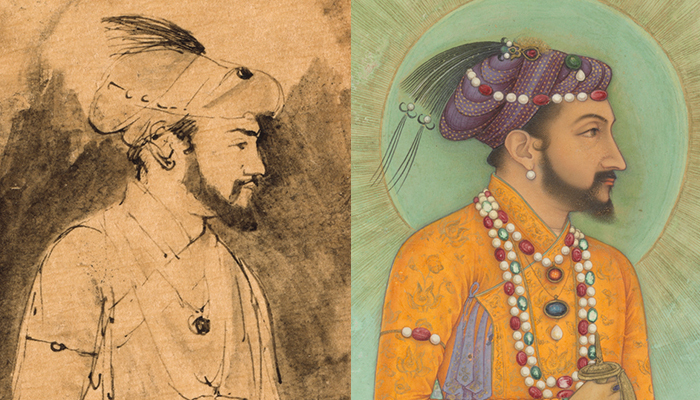 Rembrandt’s portraits reveal how his contact with Mughal art inspired him to draw in a newly refined and precise style. “The critical eye and attentive curiosity Rembrandt turned towards Mughal portrait conventions still captivates viewers today. At this late stage in his career, around 1656-1661, this meticulous rendering is exceptional,” says Stephanie Schrader, Curator of Drawings and organizer of the exhibition. Rembrandt and the Inspiration of India also examines how global trade and cultural exchange impacted artists working for Mughal emperors in India, who were in turn inspired by Dutch and Flemish printed images of European rules and scenes of daily life. Among the treasures found in a Dutch East India ship, which sank en route to China in 1597, was a package that contained four hundred prints by and after Dutch and Flemish artists. This astounding quantity suggests that Dutch merchants thought that art would help them gain access to the Asian market in the sixteenth and seventeenth centuries. These prints were particularly interesting to Mughal court artists, who were already accustomed to working with single-tone drawings and calligraphy. Rather than copy the European compositions exactly, Mughal artists adapted them to their own artistic purposes, as seen in Keshav Das’s Roman Hero (about 1590-95), based on prints by the Dutch artist Hendrick Goltzius. The use of these prints illuminates the range of images that found a positive reception in India long before Rembrandt made his creative copies. The Mughal Emperor Shah Jahan (r. 1627-1658) was well known for his patronage of the arts — most notably the building of the Taj Mahal. 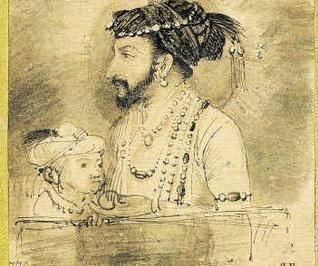 Shah Jahan’s rule of Mughal India spanned the years that Rembrandt worked in Leiden and Amsterdam. 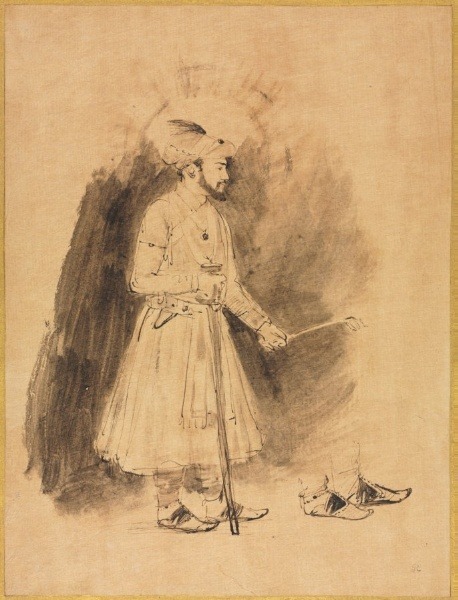 In his eight drawings of Shah Jahan, more than he made of any other Mughal ruler, Rembrandt carefully studied the trappings of imperial magnificence, as seen in A Mughal Nobleman on Horseback (Shah Jahan) (about 1656-61). 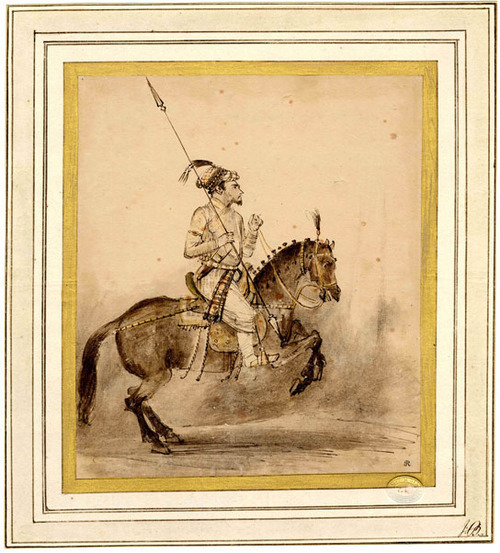 The poetic claim that Shah Jahan was “Royal Rider of the Piebald Steed of the World” was not lost on Rembrandt. 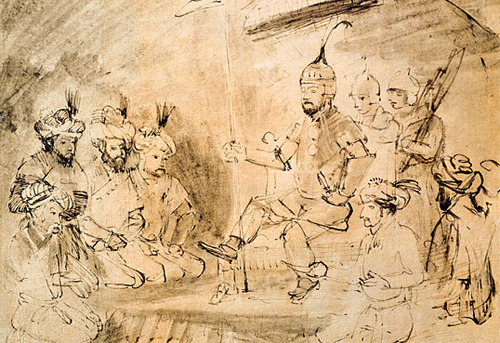 Rembrandt’s drawings after Mughal compositions constitute the largest group, by far, of his copies after other works of art. Moreover, they are his only surviving drawings on expensive Asian paper, which suggests the high value the artist himself placed on them. 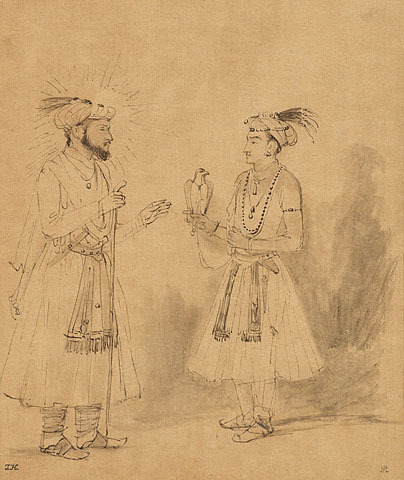 Shah Jahan and Dara Shikoh (about 1656-60) is quite different from the typically known “late Rembrandt” style of drawing. His careful attention to details of clothing, jewelry, turbans, and footwear pays tribute to Mughal artists’ exceptional artifice. On almost every level, Rembrandt and the Indian court painters operated in completely different worlds. Yet such differences did not prevent these innovative artists from appropriating foreign imagery to reflect upon and enrich their own more familiar artistic practice and culture. 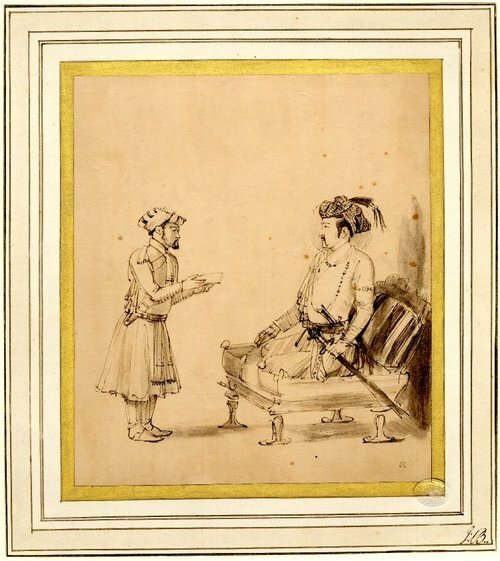 Rembrandt and the Inspiration of India is curated by Stephanie Schrader, curator in the Department of Drawings. An exploration of twenty -three of Rembrandt’s most unusual drawings, all inspired by the majesty of the Mughal Empire and its art. The history of artistic exchange between cultures is always fascinating, which is never more true than wh en looking at the seventeenth century when there was a rich interchange between the Netherlands and the Mughal Empire. 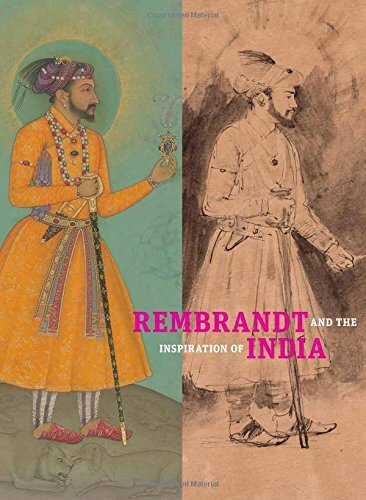 Rembrandt and the Inspiration of India edited by Stephanie Schrader (Getty Publications, $39.95, hardcover) examines the impact of Indian art and culture on Rembrandt (1606– 1669) in the late 1650s. By pairing Rembrandt’s twenty -two extant drawings of Shah Jahan, Jahangir, Dara Shikoh, and other Mughal courtiers with Mughal paintings of similar compositions, the book critiques the prevailing notion that Rembrandt “brought life” to the static Mughal art. Written by scholars of both Dutch and Indian art, the essays in this volume instead demonstrate how Rembrandt’s contact with Mughal painting inspired him to draw in an entirely new, refined style on Asian paper—an approach that was shaped by the Dutch trade in Asia and prompted by the curiosity of a foreign culture. Seen in this light, Rembrandt’s engagement with India enriches our understanding of collecting in seventeenth-century Amsterdam, the Dutch global economy, and Rembrandt’s artistic self-fashioning. A close examination of the Mughal imperial workshop provides new insights into how Indian paintings came to Europe as well as how Dutch prints were incorporated into Mughal compositions. This volume is published to accompany the exhibition on view at the J. Paul Getty Museum at the Getty Center , March 13 to June 24, 2018. Stephanie Schrader is curator of drawings at the J. Paul Getty Museum. She is editor of Looking East: Rubens’s Encounter with Asia (Getty Publications, 2013) .